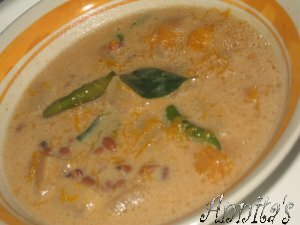 Olan, a traditional Kerala Sadya dish is a typical Malayalee preparation which is enriched with coconut milk.This is again a simple dish where red grams,ash gourd and pumpkin are cooked together in a thin coconut milk gravy and seasoned with coconut oil and curry leaves. And it has a unique, pleasing and inviting aroma which itself make you crave for the dish. Pressure cook red gram dal until it is soft ,but not losing its shape.Keep it aside.Into a deep pan add ashgourd dices,pumpkin dices,slit green chillies,salt and 1/4 cup of water.Cover it and cook until the vegetables turn soft.Add more water if needed.When it is done,add in the cooked red gram dal,stir and add thin coconut milk.Allow it to boil,and when the gravy thickens ,add thick coconut milk.Again bring it to a boil,stirring occasionally.Remove it from the stove,season with coconut oil and a sprig of curry leaves.Mix well,cover it with a lid and allow it to stand for 1/2 an hour before serving.This will help the dish to absorb the flavour of curry leaves and coconut oil.Serve with rice. This entry was posted on June 8, 2007 at 3:05 pm	and is filed under Dals & Pulses, OnaSadya, Traditional Kerala Dishes, Veg Dishes. You can follow any responses to this entry through the RSS 2.0 feed. You can leave a response, or trackback from your own site. I bet it tastes good but it looks like someone took a huge vomit in the bowl. Annita! Only today I was saying that I have not seen you come up on my feeds in a while. Hope all is well with you and the family. 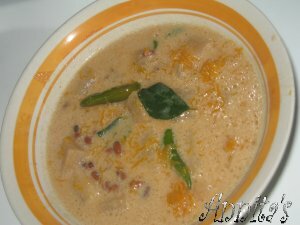 Thanks for sharing another recipe from your Kerala. 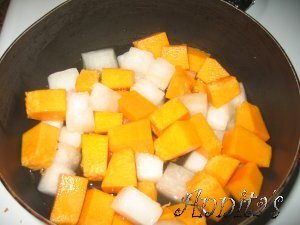 thanks for this great recepie annita.. M.I.L collections ano..i always want to try this..now i can try with confidence..
hmm. good to see ur back.. hope everything is ok. I make olan but adding redgram in olan is new for me!Thanks for the recipe..
First time in ur blog.Good recipes to try. 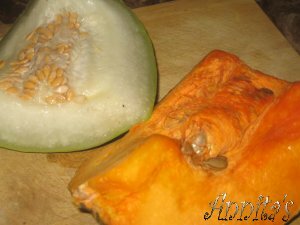 which mixer/grinder u are using for grinding coconut ?indian one?or american blender? Good to see olan! We use only mathan and red gram in the olan. It’s a lovely dish! heard of olan a lot but never tried it. looks yummy. tried it out yesterday. did not know what red gram dal or vanpayr was. so used masoor dal. that was the only red colour dal i had, but i knew in my heart it was not that. but anyway loved it and so did my family. what is the other name for red gram dal or vanpayar? You can call it small red beans also..It looks similar to kidney beans,but smaller in size..
Hi Annita, Keralan dishes are always so yumm,a nd your olan looks very promising. Thanks for posting it. Cheers! I would love to get the Bamboo Baby Blanket for a baby gift. You’re so interesting! I do not suppose I’ve read a single thing like that before.